It’s a Southern Thing, is a new social brand celebrating everything southern—from food, culture and places, to all other aspects of Southern life. Priester’s Pecans is an Alabama-based retail store and e-commerce company, selling a variety of pecans and Southern goods. The challenge was to create content marketing naturally weaving in the Priester’s Pecans marketing message while intriguing the audience. 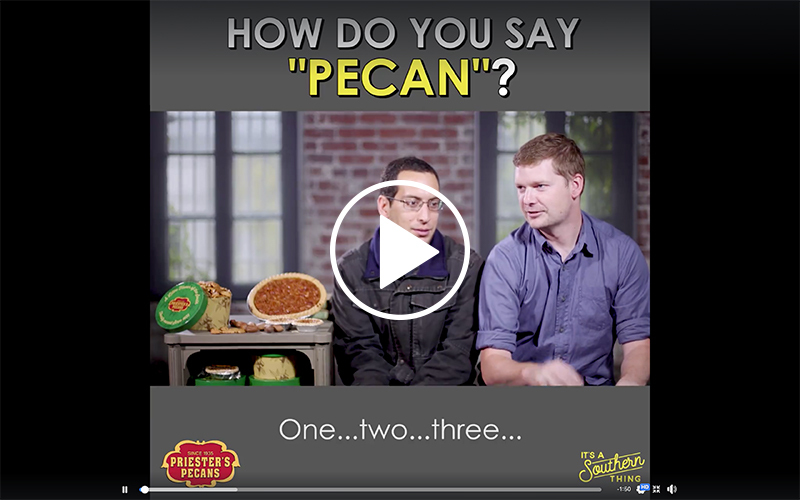 To answer this challenge, we created a fun debate video: How Do You Say “Pecan”? Find out how Alabama Media Group was able to show the Priester’s Pecan brand to a new audience in a unique way. The objective of this campaign was to show the Priester’s Pecan brand to a new audience in a unique way. Rather than trying a more traditional TV commercial, we wanted the viewers to give their opinion and interact with the brand. We also wanted to further establish Priester’s Pecan’s social presence, by showing their message to an audience that had not reached before. This video put them in front of a larger audience both from a numbers and geographic perspective. The deliverables on this project included full production of a video custom-concepted for the client (of which they own the finished asset to reuse/repurpose if they choose), and access to our audience on the It’s a Southern Thing platform of more than 35 million people across the south and beyond. When the video was posted, they received social tagging, a custom written post including their website URL, brand representation throughout the video, and product placement. We posted this video to the It’s a Southern Thing platform twice. We first posted in mid-October, and again the week before Thanksgiving for additional reach. Between the two posts, this video garnered more 1.3 million video views and reached more than 3.4 million people. From an engagement perspective, this video had more than 70,000 engagements (likes, comments, shares, etc) on Facebook. This video was watched for more than 13,000 hours, with the client’s brand and product in frame for this entirety. The top audience for these videos was women age 25-34, an audience this client had difficulty reaching before, so we saw this a great success in exposing their brand to an audience that likely didn’t know them prior. In addition to this large amount of brand awareness and engagement that the client received, we also saw an increase in their Facebook followers. More than 640 new Facebook followers equaled a 5% growth for them from this video alone.